Below you’ll find a range of GU10 LED bulbs, these professional and affordable bulbs come in a variety of types to ensure you have what you need. These bulbs are suitable for domestic and commercial use and with a wide selection available First Lighting are confident we have the right product for you. Shop the GU10 LED light bulbs below that are available in an assortment of lumens, colours, shapes and styles. The different rooms in your home will require different forms of lighting, and here at First Lighting, we have it all. Here you’ll specifically find the GU10 LED bulbs, perfect for both use in the home and commercially too. The GU10 LED is a retrofit energy saving replacement for halogen lamps that use the latest LED (Light Emitting Diode) technology. Below you’ll find the right GU10 LED bulbs that are suitable for shower lights, to add not only an extra safety feature in a wet room but add a modern touch to the decor. 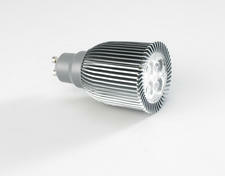 We also have dimmable GU10 LED’s that are ideal for rooms like the bedroom, living room and dining room. The dimmable fixtures mean you can create ambience and atmosphere by turning down the brightness. These bulbs are often used in recessed downlighters and spotlights, and here you’ll find a selection of spotlight fittings in chrome finishes, perfect to add a modern touch to any room in the home. The tilting spotlights are ideal for those who need to direct the light to specific dark areas you might find in your home. And the fire rated lights ensure there are no safety issues when it comes to installing your recessed downlights. Finally, the colour changing light bulb is perfect for those who want to tailor the colour to match the decor in your home. Shop our range of GU10 LED light fixtures and bulbs now, all of which are backed by our 5-year warranty and quality guaranteed.